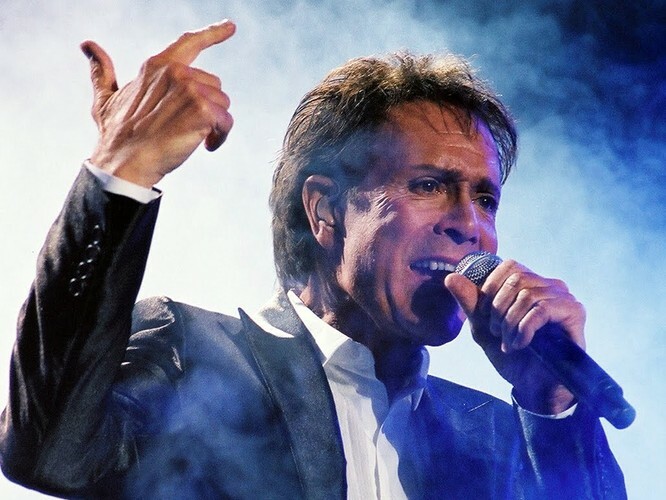 Sir Cliff Richard, OBE (born Harry Rodger Webb; 14 October 1940) is a British pop singer, musician, performer, actor, and philanthropist. With his backing group The Shadows, Richard, originally positioned as a rebellious rock and roll singer in the style of Little Richard and Elvis Presley, dominated the British popular music scene in the pre-Beatles period of the late 1950s and early 1960s. His 1958 hit single "Move It" is often described as Britain's first authentic rock and roll song, and John Lennon once claimed that "before Cliff and the Shadows, there had been nothing worth listening to in British music." A conversion to Christianity and subsequent softening of his music later led to a more middle of the road pop image, sometimes venturing into gospel music. Over a 53-year career, Richard has become a fixture of the British entertainment world, amassing many gold and platinum discs and awards, including three Brit awards and two Ivor Novello awards. He has had more than 130 singles, albums and EPs make the UK Top 20, more than any other artist and holds the record (with Elvis Presley) as the only act to make the UK singles charts in all of its first six decades (1950s–2000s). He has achieved 14 UK No. 1 singles (or 18, depending on the counting methodology) and is the only singer to have had a No. 1 single in the UK in six consecutive decades: the 1950s through to the 2000s (discounting digital downloads and counting only CDs, he had a UK No. 1 single in the 2000s). Richard is the third biggest selling singles artist of all time in the UK, with total sales of over 21 million, and has reportedly sold an estimated 250 million records worldwide. Richard has never achieved the same impact in the United States despite eight US Top 40 singles, including the million-selling "Devil Woman" and "We Don't Talk Anymore", the latter becoming the first to reach the Hot 100's top 40 in the 1980s by a singer who had been in the top 40 in the 1950s, 1960s, and 1970s. In Canada, Richard achieved moderate success in the 1980s with several albums reaching platinum status. He has remained a popular music, film, and television personality in Australia, New Zealand, South Africa, Northern Europe and Asia, and he retains a following in other countries. Outlook: Millennium pop revival - Macy Gray, Wheatus and Hanson in town, and more!